While ESS Sabre32 DAC has been widely recognized and employed in the audiophile community as the next step in converter technology, Apogee is one of the first pro audio manufacturers to employ this DAC in an interface designed for audio and video professionals. ESS Sabre32 DAC technology is included in Duet 2, Duet for iPad & Mac, Ensemble, Quartet and Symphony I/O. The benefits of the ESS DAC are seen in the astonishingly low THD+N specification and large dynamic range, the preservation of audio performance at any attenuation level (Symphony I/O), and the audio fidelity and transparency for which Apogee is renowned. The chart below specifies noise, distortion and dynamic range measurements for various popular converters. Duet/Quartet performance exceeds that of other high-end units, while Symphony I/O performance is unrivaled by any converter available. 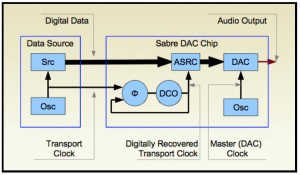 The ESS Sabre32 DAC offers revolutionary solutions to the design challenges inherent with a digital-to-analog converter. 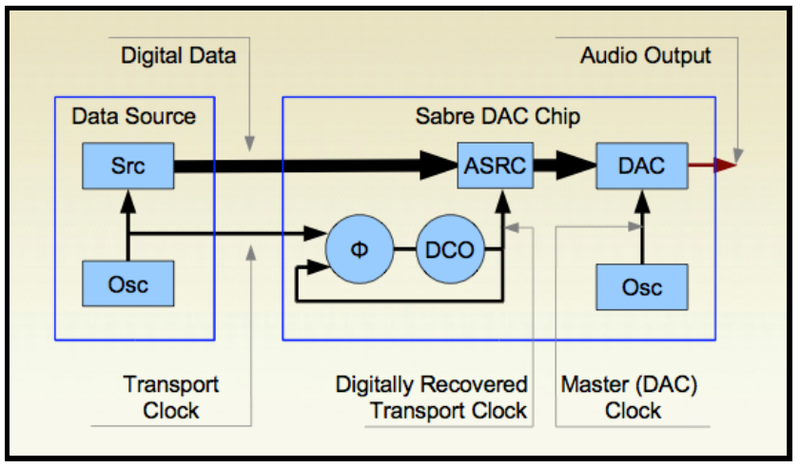 The clock that drives a DAC has rather contradictory requirements – it must lock to the incoming jittery digital data in order recover each bit correctly, but it can’t pass this jitter onto the D-to-A stage, where jitter will degrade the analog audio output. ESS overcomes this dilemma with their Time Domain Jitter Eliminator process, which consists of 1) an internal, lowjitter reference clock to drive the D-to-A stage 2) the Asynchronous Sample Rate Converter that analyses the incoming data clock and algorithmically corrects the data bitstream for perfect transmission to the D-to-A without a traditional phase lock loop. Other delta sigma converters suffer from noise artifacts that are inherent to oversampled, noise shaping designs; ESS’s HyperStream modulator includes innovations to removes these artifacts. All delta sigma converters include a digital interpolation filter, to convert the incoming PCM data (i.e. 96kHz, 24-bit) to a delta sigma bitstream. 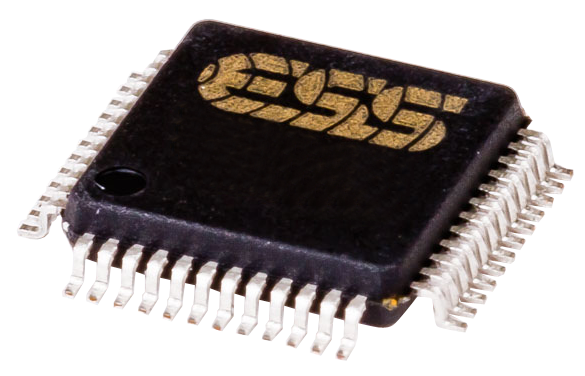 Unlike older 24-bit DACs, the ESS performs these DSP operations at a resolution of 32 bits for lower noise and distortion. The ESS DAC provides 32-bit digital attenuation for monitor volume control when connecting directly to powered speakers. When compared to alternate attenuation designs, 32-bit digital attenuation provides the best performance and flexibility. In the past, digital attenuation (at 24-bit resolution) was not considered the best way to provide monitor level control – lowering the output level results in a loss of resolution. Digitally-controlled analog attenuation, as employed in previous Apogee designs, was the revolutionary solution that offered the flexibility of software control while maintaining resolution and perfect stereo/5.1 channel tracking.